A trip to Varese Ligure, Italy, will bring you face to face with a charming town of pastel-colored houses and a plethora of restaurants serving dishes with organic porcini mushrooms and chestnuts. Stop at the bustling markets and you will see Italians who have traveled from far and wide to purchase the locally produced organic meats, cheeses, and honey. It’s a far cry from just 20 years ago, when this town in the Liguria region of northwest Italy was fading away due to a lack of jobs, no industry, decaying properties, and a lack of essential services. At the end of the 1980s, Varese Ligure, a small town (pop: 2,400) located in the Vara valley in the province of La Spezia, had gone from a population of 6,000 to 2,250. However, the mayor at the time, Maurizio Caranza, refused to give up hope for his dying town. He decided to take what others thought of as Varese Ligure’s weaknesses—geographical isolation, lack of modern industry, antiquated farming practices—and turn them into strengths. He realized the valley’s clean air and unspoiled land were assets and opportunities. What better way to capitalize on those attributes than by becoming a sustainable tourist destination through renewable energy and organic farming? “We realized the only thing to do to prevent the village from dying was to protect the environment and rehabilitate the agriculture sector,” Caranza told Italian news agency Adnkronos International. The forward-thinking mayor hit on a gold mine. This was in the early 1990s, before climate change and mad cow disease became household words. Little did he know that in the following decades the organic and environmental movements would mushroom (pun intended). Now, 20 years later, four wind turbines produce 8 gigawatt-hours of electricity per year, generating three times more electricity than the town uses. The town hall and secondary school are covered with solar photovoltaic panels, producing on site 98 percent and 62 percent of their electricity needs, respectively. The wastewater treatment plant has a 4 kW PV system and the town swimming pool is heated with solar panels. There is also a small 8 kW hydroelectric system. The electricity from the renewable energy systems is fed into the local grid managed by ACAM, the electric utility company in La Spezia. While ACAM manages and maintains the wind turbines, the ACAM utility and the municipality jointly own them. 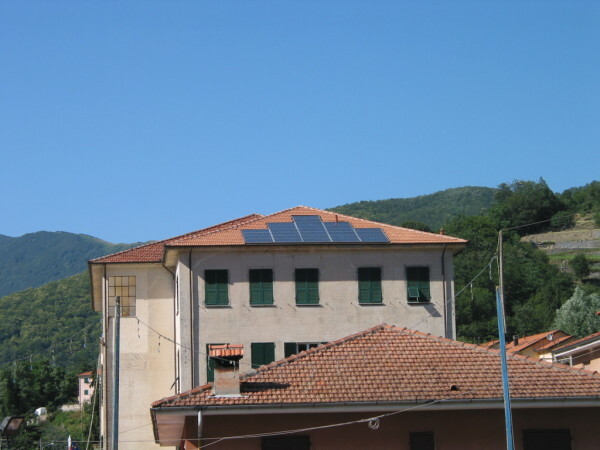 ACAM pays Varese Ligure about $30,000 each year for the excess electricity and also provides the town with various services as part of its payment for the electricity, such as sorted waste and landfill site management. There was also a lot of education about organic farming practices, and a push for farmers to stop using chemical fertilizers. Most farmers actually couldn’t afford chemical fertilizers, so were farming organically out of necessity already, but weren’t officially certified. To get these conservative farmers to become organic certified, Caranza explained that organic products could be sold at higher prices and helped farmers get EU grants for organic farms. Now 108 organic farms supply 98 percent of town’s produce, meat, and dairy products. The Vara valley, now known as the “Organic Valley,” became Europe’s first valley to be certified ISO 14001, the international benchmark for environmental management. One important program they started in the town in 1996 was the Environmental Education Center (CEA), which educates children of the region about organic agriculture, renewable energy, and sustainability. The CEA takes schoolchildren on tours of organic farms, dairy cooperatives, and bee keeping operations; it offers educational courses on small wind turbines, solar panels, and solar cookers; and it educates youth about energy consumption and climate change. Varese Ligure is currently rated one of the best small towns in Italy by the Touring Club Italiano, even receiving the organization’s orange flag, awarded to small towns for excellency in tourism, hospitality, and the environment. There has been a 500-percent increase in tourists since the late 1990s, an additional $514,000 in annual tax revenues, 140 new jobs, and a stable population. Caranza is proud of what has become of his town. “Tourism is an important sector for six months a year, local farmers produce an abundance of organic fruit and vegetables, meat and dairy products, and the village now recycles 25 percent of its refuse,” he reported to Adnkronos International. “Because the political will existed, we succeeded in arresting Varese Ligure’s decline.” And more than arresting decline, with a mixture of clean energy and sustainable agriculture, they have truly transformed the community.